Yep. "Problem" is we keep it in Mercurial, so we basically have "hg grep" for it, which isn't overly efficient. Need to index this separately. Issue #3630 was marked as a duplicate of this issue. Issue #6477 was marked as a duplicate of this issue. Issue #7013 was marked as a duplicate of this issue. Five years asking for something "basic" as a wiki search? lol... 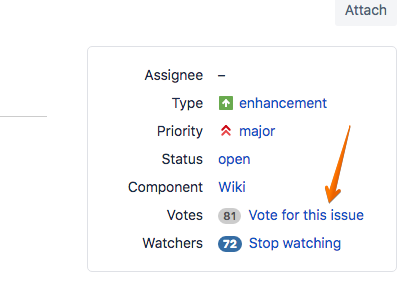 I hope the wiki goes into a hacking weekend in Bitbucket offices, they've added tons of new features recently, but the wiki is totally forgotten. Hi, the search feature is a must have because it is almost useless to have unsearchable documentation. Please, commenters, vote for this issue, It only has 5 votes! Is this site actually used to manage requests that get worked on or is it just a way for Atlassian to make you feel like your voice is being heard? Just asking to know if I should even bother thinking new features will be implemented or if I should take BitBucket for what it today and move on. I am working on a new project and trying to decide between BitBucket, GitHub or Assembla. Wiki without search is not that useful, we might as well use Word Documents and print them. We use Google Docs simply because it is searchable. It would be much nicer to store extra information with the code but this way it are more portable. Now that source code searching has been added into bitbucket, any updates on searching the wiki? This issue's gonna be 9 years old in about 2 months. Wow .. "THEY SHOULD BE AWARDED" .. for such an achievement. I'm part of a team that wants to document a lot in this wiki but if you can't search it isn't even worth to go to the wiki if you want to find something. I really hope that someone thinks about adding this feature because otherwise the wiki is totally useless. after 7 days anniversary, 10 years! +1. does any one from Atlassian ever read this? Water Guo, you only comment this issue, dont vote. Well, just past 100 votes. Atlassian, you going to listen a bit now maybe? Our team would love to start using the wikis in BitBucket, but lack of search is a bit of a problem for us. Any official news on this yet? Well, Github now offers unlimited private repos to all users. I think this issue will no longer impact personal projects.